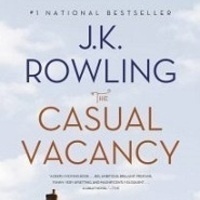 MIT Reads presents: Community Perspectives on J.K. Rowling’s "The Casual Vacancy"
Domestic violence. Marital discord. Racism. Dysfunctional family dynamics. Class warfare. For a small town, Pagford sure has some big problems. Open to the entire MIT community; sign up here to add this event to your calendar. Please contact Nina Davis-Millis by April 15 if you have accessibility needs.